The first lake on the trail. I wanted to write about Cayambe Coca National Park but the truth is that I can’t do it justice. The park is a grand 3,700 square kilometers (1,430 square miles) and much too large to describe in a single blog post. Its terrain runs from the high moors to the low jungle and everything in between. 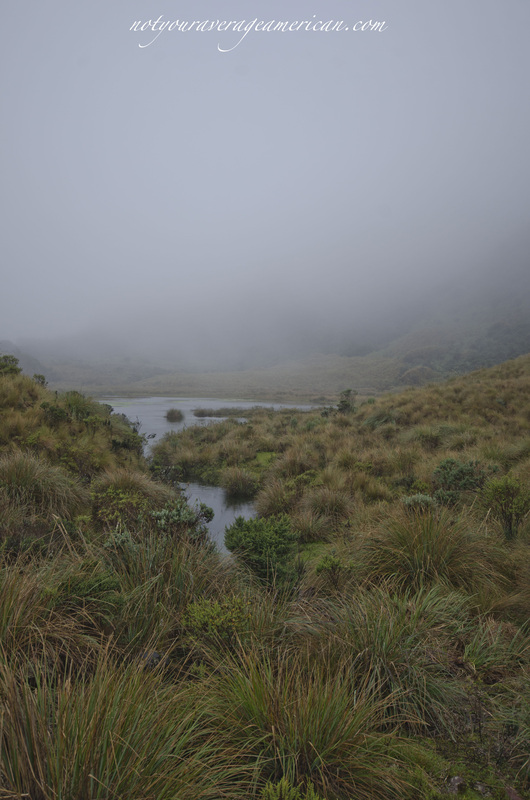 We explored a single ecosystem – the high mountain lakes and grassy hills that can be found just 20 minutes from the parking lot of Las Termas Papallacta. Only 36 people a day are permitted to enter the park from this entrance – the high paramo is a very delicate eco-system. During our trip, we saw about a dozen other people, all of them fishing in the high mountain lakes. As far as we know, we were the only hikers of the day even though there are several trail heads that start at the small ranger station. The weather may have had something to do with it. The day started cloudy and overcast, with low lying fog in many places and it only turned to mist and rain later in the day. At times, we felt like we were crossing the moors of Scotland in a hunt for mysterious elk. The trail we chose, El Agua y La Vida, is really a dirt road that is blocked to large vehicles. We did have one 4-wheeler pass us on the trail but otherwise the road was quiet and we shared it only with a few Antpitta and nothing more. Early on the trail there were a few places to explore – one particularly intriguing trail led to the base of a waterfall that we could see in the distance. It’s on our to-do list for the next visit. But as we hiked further in the ground became muddier and the road was less a path than it was a bog. We passed beautiful mountain lakes that mirrored the gray cloudy sky. As the mist turned to rain, we decided that the hike was finished for the day. We came away with stark photos of high mountain lakes, pants covered with mud, and a desire to return with the sunshine. At the ranger station, we asked about the persistent rain and we learned an important lesson. Although it is summertime in Quito, a mere 24 kilometers away, in Cayambe Coca NP June is winter time. Life on the equator is full of conundrums like this. And though we’d like to believe it’s winter because Cayambe-Coca is south of the Equator, Quito lies south as well. Seasons have less to do with actual location and more to do with weather conditions. If it’s raining most days, it must be winter. A waterfall as seen from the trail. The road in a not so muddy spot. Close-up of bright pink mushrooms. A lake reflecting the cloud cover. Tawny Antpitta along the side of the road. A Tawny Antpitta seeking cover of the brush. A bizarre out-of-place cactus – yet they were everywhere. The clearing sky is back towards the town of Papallacta. Welcome sign at the entrance to the park. What’s the temperature you experienced in these pix? The air looks saturated, but I’m trying to imagine the feeling. In the high 40Fs at the lowest, I think… we wore gloves at times to keep our fingers warm but didn’t need them all the time. Funny enough, it was warmer once it started raining! You’re breakin’ my heart AJ. Thanks for the lovely visit.